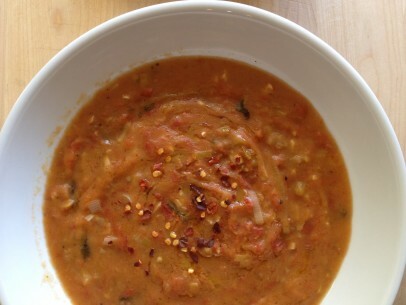 The secret to this incredibly creamy, spoon coating soup – an olive oil roux! So smooth and decadently flavorful, you’ll find any and every excuse to cook up a pot full of this outstanding tomato soup. There are only a few ingredients in this recipe so make sure they’re the best quality you can get. Leeks are very important to this soup as the base that all the other veggies build on. They lend a more subtle taste than say, white or red onions would. 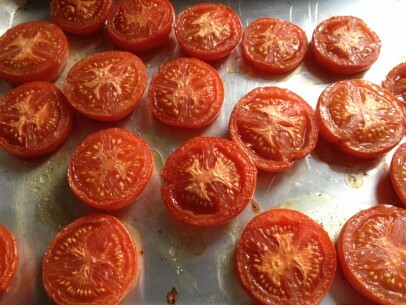 Grated carrots melt away and add a lovely, light natural sweetness to the chunky roasted tomatoes. The fresh (not dried!) mint brings a bright pop to every spoonful. Cooking down all of the vegetables together before adding the tomatoes allows their flavors to intensify so they can hold their own and are not overwhelmed by the roasted tomato flavor. This step helps to create a perfect balance of tastes. You’ll notice this recipe calls for very little oil. This is because you’ll add more oil in with the roux. An olive oil roux is one of the best Greek vegan cooking techniques I know. 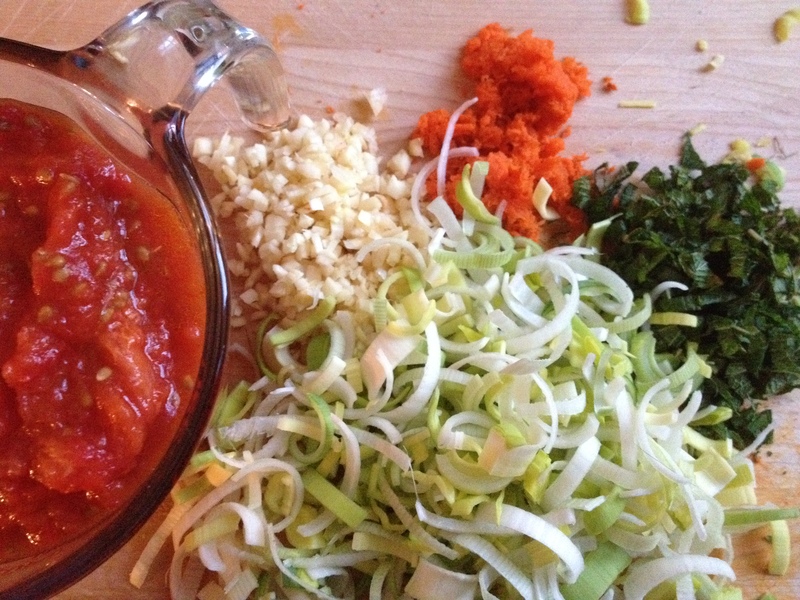 Just as in a butter and flour roux, the cooked mixture is used to thicken soups and sauces. Slow and thorough cooking of your roux gives you a glossy, creamy result that’s so often missing from ordinary vegan soups. The measurements for the roux below make approximately 5 tablespoons. I usually use about 3 tbsp for my tomato soup but depending on how thick you like your soup you can use up to the entire 5 tbsp. Save any leftover roux in a plastic sandwich bag in the refrigerator to use another time, it will stay forever. I found some at the back of the fridge one time that had been in there over three months and it worked perfectly. I often make a double batch, separate it out by tablespoons and have them on hand. Saving that extra step helps a lot on a busy weeknight! I love to serve this with toasted bread triangles, a very light drizzle of olive oil and a pinch or two of crushed red pepper flakes. Its a most delicious meal and the recipe is easily scalable. I’ve doubled and tripled the measurements below with no problems. Quick thing to note – as the soup cools, a thin skin forms on the surface almost like what forms on pudding. Not to worry, simply give your soup a quick stir and the skin is incorporated right back into the soup. Heat olive oil on low heat in a small (egg) pan. You’ll know your oil is ready when a tiny pinch of flour added to the oil dances and hisses. Once oil is hot, add flour and stir well until you get a loose paste. 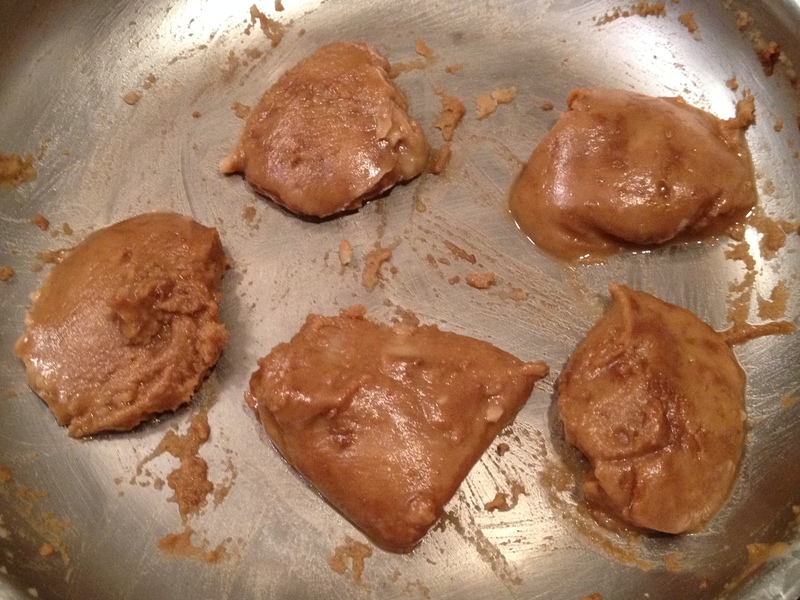 Cook roux over low heat, stirring often, until you get to a medium carmel color – about 6-8 minutes. Careful not to burn! 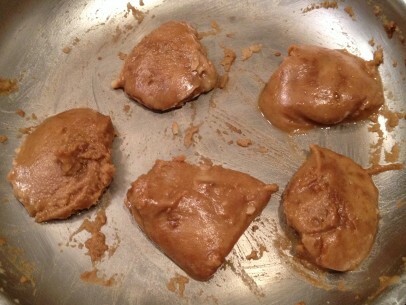 Once you get to the caramel cover, remove from heat and set aside. In 3 qt saucepan, saute leeks in 3tbsp olive oil on low heat. After 5 min, add garlic. 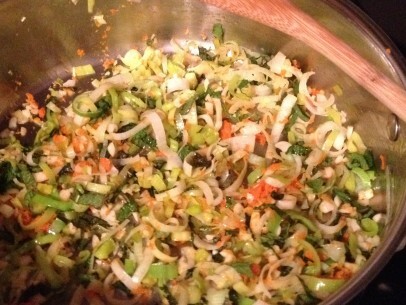 After 3 min, add grated carrots and chopped mint. Stir frequently, cook for another 3 minutes and add tomatoes. Stir in salt/pepper/sugar and cook, uncovered , on low for 5 minutes. Add water, stir to combine and raise heat to medium-high and cook for approx 4-5 minutes until soup gets to a very low boil. Add roux and stir gently to combine completely. Continue to cook at very low boil for 5 minutes, stirring often. Lower heat way down until soup is at a very low simmer. Cook, uncovered, on low heat for 10 minutes. Remove from heat. You can enjoy it a bit on the chunky size right from the stove top or use an immersion or counter top blender and puree to your desired smoothness. Either way, serve hot with crusty bread for a so satisfying meal. I like to garnish with red pepper flakes. As it cools, a thin skin will form over the top of your soup – just give it a quick stir and it’ll be good as new. To reheat – add 1 tbsp of water for every cup of soup, cover and heat on very low for 5-10 minutes. The slower re-heating the better! WOW. Firstly, this soup is SO SO SO tasty!!! At first, I thought “Mint?? ?” After making this lovely soup, my thought is “Of course, mint!! !” Thank you for this amazing recipe! Not only have your clear and concise instructions and tips on every recipe (ie. making a roux and roasting tomatoes, etc.) increased my cooking confidence (because when I follow your exact instructions, they are BANG ON), they gave me the confidence to try SO many things I wouldn’t have otherwise! I made this this week, and it was just fantastic!! I left out the roux because my husband likes more liquid soup, and it was still wonderful. This will be a Lenten tradition. Thank you so much. 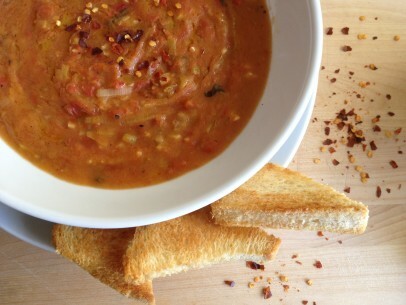 It is a very tasty and very simple soup.I made it yesterday and it was fantastic. I regularly cook a full brunch for 80 people at my church. Since I’m a vegan that cooks with no added salt-oil-sugar I use Greek orthodox Great Lent recipes a lot. I made this yesterday and the soup was gone in 10 minutes. Since I don’t use oil, I water-sautéd the leeks and garlic I made my roux flour by roasting the flour in the oven. Because I was making such large quantities, I ran the carrots, leeks, and mint through my Breville blender till I had the smoothness I wanted for the final soup. Thanks for this and the dozens of other recipes I’ve used from your site!